The Legend of John Henry: Folklore and the Lives of African Americans in the Postwar South - U.S. 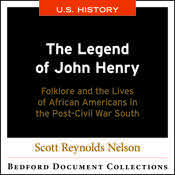 This document collection examines the folklore that surrounds John Henry to help students better understand the lives of African Americans living in the post-Civil War South. The selections within this collection are messy and multivocal; they can be read many different ways, requiring students to critically evaluate each source. Students are guided through their analysis of the primary sources with an author-provided learning objective, central question, and historical context.